Red Cherry Shrimps are primarily scavengers and algae eaters, but are also considered omnivores as they will eat almost anything. Their most common food source is algae which they clean of off any surface that it grows on. With Red Cherry Shrimp, you will not need any algae growth control solution; they will clean your tank like a proper cleaning crew. But algae should not be their only food source; other Red Cherry Shrimp food should be added, to keep them fed. A regular stable diet of commercial aquarium food, such as algae wafers, shrimp pallets, fish flakes and/or bloodworms should also be provided. But be sure to read the ingredients label carefully, any food that contains copper is not recommended, as it is deadly for them in very little doses. A great thing to also add to their menu are blanched vegetables; carrots, zucchini, lettuce and spinach are all appetizing additions to their daily feeding regime. Use small pieces, and do remove them within 24 hours, to avoid any water pollution due to rotting vegetables. Feeding is best done once a day, preferably at ‘lights-out’. Feed only the amount of food, that the shrimp can finish within 2 – 3 hours. Do not overfeed and remove any leftover food from the aquarium. Rotting food or plants can cause dangerous ammonia and nitrite spikes. Shrimps regularly shed their shells, do not remove those, they are a great source of vitamins and minerals for them to consume. 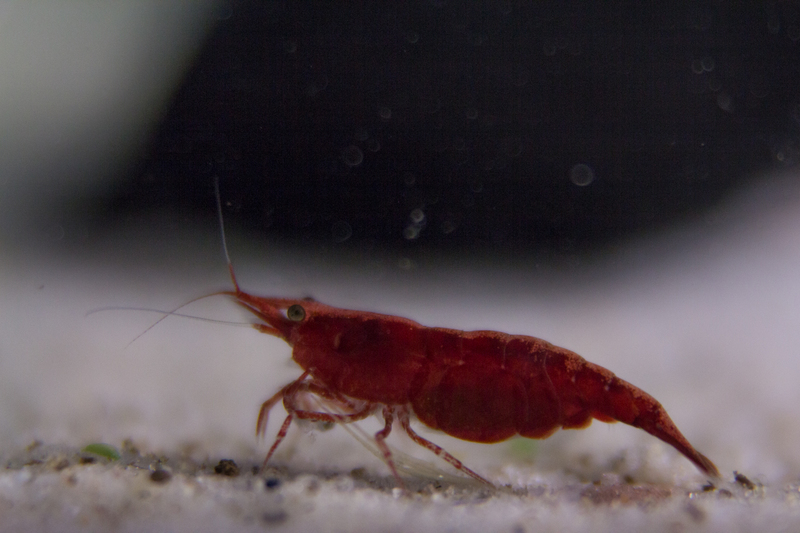 As said before, Red Cherry Shrimps are scavengers, they don’t necessarily graze all day, but they do spend their entire day scavenging around for food. There is nothing wrong if you forget to feed them for a day or two, they will find food on plants, rocks, in the substrate, on the sponge of the filter, etc. This is more or less everything you need to know about Red Cherry Shrimp Food and Feeding Regime.